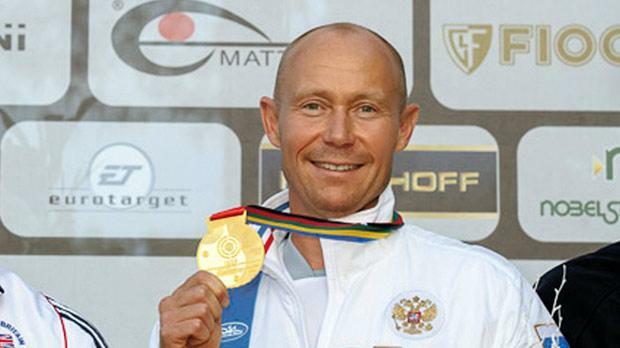 Russian Vasily Mosin beat Great Britain’s Tim Kneale in Monday’s gold medal match to claim the Double Trap world title. Mosin had already made sure of his place in Rio next year during this year’s World Cup in Al-Ain (UAE), so the two Olympic Games slots available in Lonato, Italy, went to Kneale and bronze medal winner Kuwait’s Ahmad Alafasi. The final was tight as both contenders shot perfectly for the first six doubles. After two close mistakes by the British shooter, however, Mosin built a comforting lead, closing the match with 29 hits against Kneale’s 26. “Since I came here for the first time in 1995 I have been dreaming about winning a championship in Lonato,” Mosin, 43, said. Both Kneale and Mosin shot outstandingly since the early rounds, where they finished with the two best scores, 142 and 140, booking a spot in the semi-final along with Australia’s James Willett and Qatar’s Rashid Al-Ahba, both 139. In a three-way shoot-off to assign the last two semi-final spots, USA’s Walton Eller and Kuwait’s Ahmad Alafasi bested Malta’s William Chetcuti who finished seventh overall. Chetcuti started the competition with a straight of 30, one of the very few in the competition. His third-round tally of 25, however, must have cost him qualification as he tied with Eller and Alafasi on 138 from a possible 150. Meanwhile, another tie-breaking shoot-off between three shooters was necessary to determine the third place as Willett, Alafasi and Al-Ahba all concluded with 26. An early mistake from the Qatari opened the way for the Australian and the Kuwaiti to decide the bronze medallist after they concluded with 24 hits each. Alafasi won the tie-breaker 4-3. Eller, the 2008 Olympic gold medallist, concluded the semi-final in sixth place with 24 hits. The Double Trap junior title went to China’s Huang Xiaomin, 19. In the final, he beat Russian Kirill Fokeev 28-27. Malta’s Nathan Lee Xuereb was two clays away from a top-six berth after finishing eighth from 25 competitors with 130 hits.